Some say that there are two kinds people in the world: those who divide people into two categories and those that don't ...cat people and dog people. I never, ever thought I'd be a "cat person." I vaguely remember asking my parents for a kitten when I was very young. I was probably three or four, and I remember my preschool-age logic being something akin to "dogs are for boys and cats are for girls." I also remember being rebuked (my father said he was allergic but I also think he just plain doesn't like cats). My family had always had dogs when I was growing up and shortly thereafter, we did end up getting a puppy. The occasional interactions I ended up having with cats that belonged to friends and came into contact with on the street ran the gamut from traumatizing to tolerable (with the notable exceptions being an orange tabby named Charlie and a black and white kitty named Taffy). Around the time I was in middle school, after breaking out in hives post-sleepover at a feline-owning friend's house, I discovered that I was indeed allergic to cat dander (moreso than dogs, anyway) and determined that I was, for all intents and purposes, a "dog person." Not only did they not illicit an allergic reaction from me, in general I found their company more enjoyable. I liked that I didn't have to worry about a dog going from complacent to homicidal mid-belly rub. Dogs like everyone! Dogs can go places with you! Dogs are happy to see you when you come home! Despite my stance as an animal lover and friend to ~all God's creatures~, I had to admit I was pretty solidly Team Dog People. However, after living in Texas a couple of years, I found myself missing animal companionship but, at the same time, I knew I wasn't in a place where I could properly care for a dog and back in August I found myself taking in Ashley after her circumstances changed. Despite my allergies and knowing literally next to nothing about cat ownership (I actually went to Half-Price Books and bought Cats for Dummies), I have found she really is the coolest, most-affectionate kitty I've ever known. 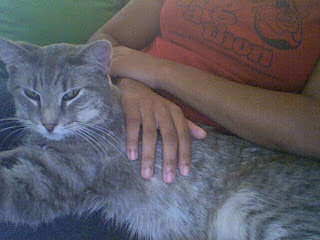 She actually is happy to see me when I come home, humors me when I insist on taking pictures in Photobooth and wants nothing more than to curl up with me wherever I am in the apartment (in bed on my laptop or on the couch watching TV). She is also very friendly and likes pretty much everyone she meets that's not under the age of 12 and doesn't make loud noises or sudden movements. I've found my allergies to be manageable with over-the-counter meds and good housekeeping, plus the longer she lives here, the more my body acclimates. I'm also enjoy a few perks of cat ownership I hadn't even considered, such as not having to go out to "take care of business" (especially in the cold/heat/bad weather or when it's too early/late) and the fact that I can be gone all day or overnight and not have to rush home, as long as there's food, water and clean litter available. 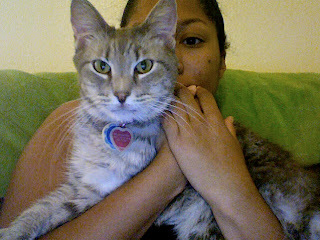 And perhaps lately I've been catching myself doing things that may err to the side of Crazy Cat Lady i.e. this past afternoon we attempted a walk outside the apartment with a harness & leash (she wasn't really having it). I have to admit it hasn't all been a cakewalk and we are still learning about each other, but I do love having her around. And while I wouldn't consider myself a complete convert, I do find myself more supportive of Team Cat People... and it's not entirely impossible to be both. Aww ... I love cats. I think I've always been a "cat person" because they're loving (most of them are. some will claw you in your sleep) and low maintenance and not all up in your grill barking 24/7 (oops, didn't mean to come off as not liking dogs). I definitely want to adopt a cat, but then I feel like I have to adopt two cats because he or she would be lonely when I'm at work. I would like to walk my cat, but you have to start when they're kittens so they used to the harness. Does your cat try to run out whenever you opened the door. My roommates cat used to get lost whenever we opened the door, and we'd spend a few minutes trying to find him (conveniently he was black and would often run out at night). Plus, he would claw at everything ... (obviously I don't think cats are perfect). Oh, your kitty is adorable!